The first time I played the popular drinking game “I’ve Never,” I was a high school sophomore, and instead of taking shots, we kept score with sugar packets at the local Shari’s. The game appealed to me for two reasons: 1) I got to learn other people’s secrets, and 2) I almost always “won” because there were a lot of things I’d never done. Fast forward to adulthood. A lack of experience is not the source of pride it once was. Since moving to Central Oregon, my craving for adventure (of the sporty, rather than salacious, variety) has only increased. How does a guy who has never climbed a tree get into the wide array of outdoor activities Bend has to offer? And, what better way to start this challenge than with the toughest of the tough guys—Navy SEALs. “So, what do you usually do for exercise,” he asked. Honesty seemed my most effective disclaimer. 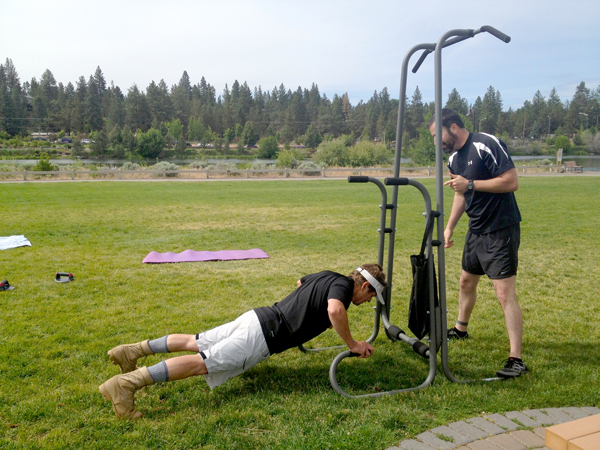 A retired Navy SEAL, Bruce and a group of fellow SEALs and friends gather in the park to go through calisthenics together every Saturday morning. Until recently, he told me, it was a private affair, but he decided to spread the word by listing the event in the newspaper. I was the only person to respond. Navy SEALs is an elite group that goes through extensive training for military operations that start in the water (hence, the name). They are notorious for being incredibly fit, and for achieving that fitness with little to no equipment (i.e., calisthenics; defn., an exercise that uses a person’s own body weight to build strength and flexibility). Much to my surprise, we started with an icebreaker. “Tell us something you’ve never told anyone before,” Bruce said. One by one, we went around the circle sharing personal anecdotes. I learned that of the six other participants, all but one were retired SEALs. The other was the wife of the youngest retiree (fresh off his final deployment), and just happens to be the head of OSU-Cascades’ Exercise and Sports Science program. We then started in with some jumping jacks and stretches. So far, so good. I learned that SEALs do not rest between sets, they just do a less intense exercise while swapping war stories and talking shop. Some of these “resting” exercises have goofy names, like “Hi Jack, Hi Jill,” so-named because the movements resemble waving to someone across the way. But don’t be deceived; it isn’t all fun and games. Every third or fourth exercise was, you guessed it, push ups—15 fast, followed by 10 slow. As the other non-SEAL pointed out: “I think your slow is my fast!” But hey, why prolong the pain? Of course, most of the time, I had no idea how many more reps remained because SEALs have an odd way of counting. For instance, 25 push-ups is “two fives,” but you count it 1-10 twice, and then 1-5. “It’s because we can’t count past 10,” Bruce joked. What I lacked in strength (yes, if you must know, my push-ups were “modified”), I made up for in coordination and flexibility. I owned the West Point Shuffle, a line-dance inspired move requiring substantial hand-eye coordination. And whenever we did a slow stretch, Bruce and the others looked on with palpable envy. If there were a game show called “Are You More Flexible than a Navy SEAL?” I would so win that. These periodic ego boosts (heck yeah, I can touch my toes!) helped carry me through weak push-ups and sad sit-ups (SEALs call them “crunchers”) while the CO’s stories distracted me from the gnawing pain in my, well, everything. Halfway through the hour’s torture, Bruce said he was going to jump in the river, and that we should join him. The only one who took the bait was, somewhat predictably, the recently retired fellow. While the rest of us enjoyed a welcome respite, the two men threw themselves into the Deschutes—clothes and shoes (in Bruce’s case, military boots) and all. By the end of the workout, I was tired, but invigorated. Full of fresh air, adrenaline and a little pride. I think I might be hooked. Want to work out like a warrior? Just check out these fierce fitness options. 9-10:30 am, Saturdays. Riverbend Park. Free. 10:30 am-noon, September 6. Old Mill. Free. Various times. Drake Park. BYOS. There’s a first time for everything, and I’m ready for my next adventure. Got a suggestion? Send it to erook@bendsource.com.